A brilliant second half performance by the pack saw Old Rishworthians come from 17-3 down to register a 20-20 draw at home to Moortown in Yorkshire One yesterday. A draw was perhaps a fitting result for a game between the two sides promoted last season from Yorkshire Two, Moortown as champions and Rishworthians as runners-up. The game was notable too as both Rishworthian props, Harry Whitfield and debutant Josh Crickmay, scored tries. The home side outscored the visitors by three tries to two and also crossed the line twice more, only to be brought back for forward passes. Rishworthians had to defend in the early stages, but came back strongly with No 8 Jack Andrews, who had an outstanding game, and the two props prominent in a move which saw stand-off Josh Kelly break through, but the final pass went to ground. They were soon on the scoreboard, though, with a Kelly penalty. Moortown hit back through the centre, where they looked dangerous the whole game, and Rishworthians had defend desperately, but were found wanting when the ball went wide for a converted try in the corner. The Copley men hit back strongly with Harvey Keighley-Payne, on his return to the club, showing the potential which took him into the county’s junior ranks. Whitfield combined well with fullback Luke Flanagan before the ball went wide for left wing Anthony Shoesmith to cross in the corner, only for play to be called back for a forward pass. Just before the break Keighley-Payne crossed as Rishworthians pressed, but the last pass was ruled forward. Moortown came out hard in the second half and straight away sliced through the home side with their speedy and strong backs for another converted try. Rishworthians were forced back again on the defensive and a penalty took it to 3-17. It was a sign for the home pack to really take charge. They kept the ball well as they drove for the visitors’ line and there was no stopping Whitfield as he crashed over wide out for an unconverted try. Tough tackling by Rishworthians stopped Moortown making progress, and when Shoesmith picked up a loose ball on halfway, he was able to complete a strong run to the corner for a second unconverted try to make it 13-17. When the visitors hit back to extend the lead with a penalty, it looked over for the home side, but they were in determined mood and fought back. Kelly almost got in with a neat break before the ball was recycled to Crickmay, who powered over. Kelly added the conversion to level the scores with only a couple of minutes left. Rishworthians were determined not to let another game slip away at the death and defended brilliantly. 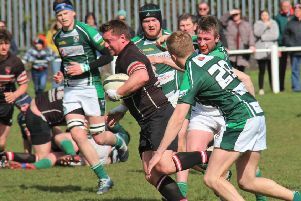 The effort was summed up with an attacking scrum to the visitors, who were pushed back in no uncertain terms, conceding a penalty, to allow Rishworthians to see out the game. The Rishworthian Development team had a fine 22-15 win over Moortown seconds with tries for Will Bowers, Josh Illingworth and Kurt Sutcliffe, who also kicked a penalty. Joe Billing added two conversions.